Ideal for situations where the maximum opening clearance is required, preventing door and cargo damage and resulting maintenance and lost revenue. 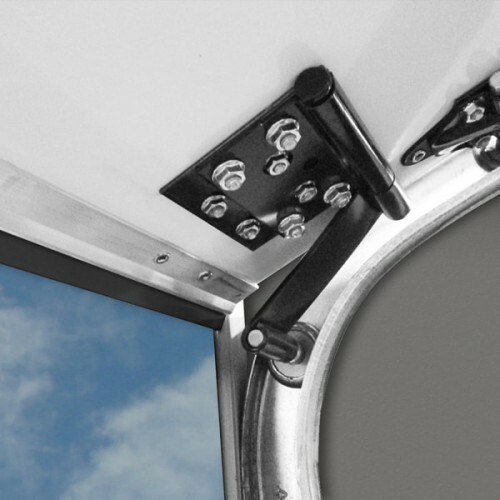 With its pivoting arm, the 7181 Hinged Bottom Roller Bracket (HBR) increases the door opening clearance by allowing the bottom panel to move safely up and inside the header. This prevents cargo and door damage by ensuring that the door cannot be struck by large or bulky cargo during loading operations, reducing maintenance costs, delayed shipments and lost revenue. By providing the maximum opening clearance, efficiency can be greatly increased when loading as staff can move cargo more easily when not maneuvering around a door. All the hardware components of the device have been E-coated for increased longevity and corrosion protection. Compatible with most WHITING roll-up door models, the 7181HBR works with both 1" or 2" track and can be used with both single & dual spring balancers.